I want to step back for a blog post and look at how I am tackling my ecology as a whole. While talking about Computing Power, Ron Eglash talks the importance of being able to formulate a problem so a computer can answer it. A parallel exists in my ecology. I need to ask the right questions about my ecology that the media we are using (image, audio, film ect) can begin to answer. In the beginning of this project I had was blindly throwing everything I could find into my projects, hoping some meaning would emerge from the and, in some ways, it did. What it showed me was what kinds of questions and answers my website could handle and dispense. Like Eglash wants scientists of today to learn how to give a problem to a computer, I learned how to give my questions to my projects. What I found was that the media I was using was useful in capturing affect. It could impart, at least to me, the emotions, tensions and interactions of the Pokemon subculture. 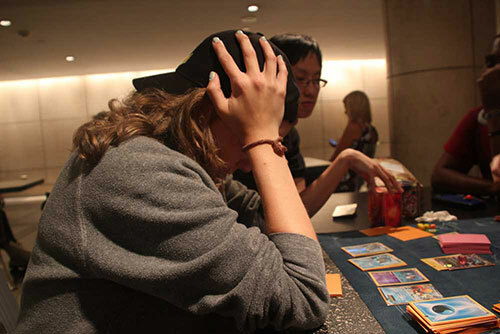 A photograph of someone about to lose, an audio file of everyone at league laughing, a video of my sleepy eyes and sleepy voice at the end of the tournament- all of it showed how this community feels. 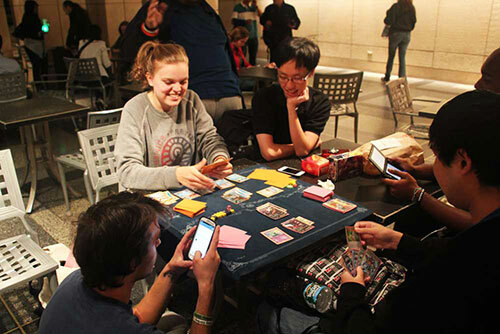 I realized that’s what I’d been trying to capture from the beginning- the incredible, extremely affective energy that Pokemon has- that makes me play. So I formulated a question to ask myself and the ecology whenever I turned on my camera or recorder: what is special about the affect in this community, that comes from these specific people and things and locations, that makes us all continue to play a game with such excitement that most people have lost interest in a decade ago and think is pretty weird? Having this question has been incredibly helpful in guiding my projects, but being able to answer it is another story. Michael Murtaugh talks about taking a heuristic approach to question answering in his essay on interactivity. A heuristic answer is “‘tended towards’ without necessarily being deﬁnitively reached”. The interactive systems he explains as coming to these sorts of answers have five main virtues: “liveness, placidity, accretion, interruption, and incompleteness.” These too are the integral and most fascinating aspects of our ecologies; they are in constant lively, flux, never complete and constantly growing and expanding. And so, we should expect from them too heuristic answers to our questions. My ecology is a highly interactive system- I am intimately engaged with it. Being able to define a question for it and use that question to dive deeper is important, but I must remember that there is no answer- I can only continue to explore and hopefully tend towards some truth by the end of the semester. Ron, Eglash. “Computing Power .” Software Studies: a lexicon. Cambridge, Mass. : MIT Press, 2008. 55-64 . Print. Murtaugh, Michael. “Interaction .” Software Studies: a lexicon. Cambridge, Mass. : MIT Press, 2008. 143-149. Print. ~ by torifranceshill on October 29, 2013.